Hecate originally derived from the Egyptian midwife Goddess Hekat. In Greece, Hecate was one of the many names for the original feminine trinity ruling Heaven, Earth and the Underworld. Greeks tended to emphasize her crone or underworld aspect. Hecate was called "Most lovely one", a title of the moon. She was associated with the moon in all three of her aspects. Some said she was Hecate Selene, the Moon in Heaven; Artemis the Huntress on Earth and Persephone the Destroyer in the Underworld. 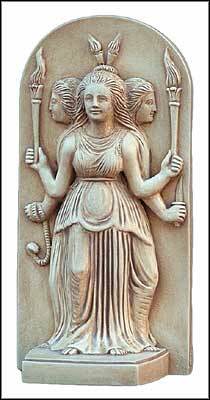 Sometimes she was part of the Queen of Heaven Trinity: Hebe the Virgin, Hera the Mother and Hecate the Crone.